The Blank Slate mounts in your doorway in minutes with no damage to the wall. Add your combination of climbing holds, hangboards, and accessories to the 17 standard t-nuts. Attach your Smartphone or Tablet for work out entertainment. Every day, we ask first responders to enter hazardous, unseen spaces. Police around the world face an increasingly complex tactical environment. The rise of the “active shooter”, with recent incidents including Aurora and the Sikh Temple shooting, has meant that the regular patrol officer now faces “SWAT-like” situations without the training and equipment of specialized team. Bounce Imaging is developing systems to fill this need. In the coming months, Bounce Imaging will enter field testing with several police units in Massachusetts. Firefighters frequently must enter burning buildings searching for victims, putting their own lives on the line. While some larger departments have access to thermal imagers, such technologies are beyond the reach of most units. Bounce Imaging is developing low-cost sensor units that not only provide an image of a space, but also transmit relevant data like temperature and oxygen levels. Soldiers today face a range of threats and situations in which they must see around a corner, inside a compound, or down a tunnel or sewer system. Bounce Imaging is developing systems that will not only make life-saving technologies accessible to front-line infantry – they will also reduce the likelihood of civilian casualties. Search & rescue after a disaster is often a slow and difficult process. Bounce Imaging is developing sensors that will not only reduce the technical difficult of searching collapsed buildings, but will also help map the unfamiliar terrain of a post-disaster landscape. Bounce Imaging’s flexible sensor platform can also be adapted to more complex tasks, such as industrial inspection or Homeland Security container inspection. A great glove at a great price $85, this allows the ones who can't disconnect to connect no matter where they are. Designed with TouchTec™ technology - which allows for gloves-on use of touch screen devices - the Stormsensor™ glove adds a techy twist to high-performance, technical alpine gloves. Supple, durable, and water-resistant leather that utilizes patent-pending nanotechnology allowing accurate use of touch-screen mobile devices. Outdoor Research utilizes TouchTec™ leather in select skiing and mountaineering handwear. The integrated light sensor is oriented in the same direction as the eyes; it measures and analyzes reflected light in order to instantly and automatically adjust the headlamp's beam pattern (wide and/or focused) and light output to the user's needs. When walking, running, etc., the beam is wide and has medium strength in order to illuminate obstacles in the path. It is hard after what has been happening the past week not to look at technology differently. This time how to recycle old bullet proof truck, with today's technology. Now the price might scare you, it will scare most, but you can't deny that this Power Wagon is on everyone's Holiday list. 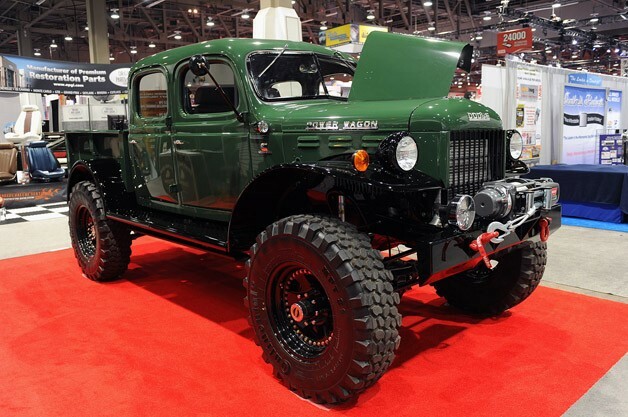 Legacy Classic Trucks in Jackson Hole, Wyoming, is using the 2012 SEMA Show to display the Legacy Power Wagon. As its name implies, the truck started life many, many years ago as a Dodge Power Wagon (built between 1945 and 1980 – not to be confused with the current version), itself based on an older military design. In stock form, the Power Wagon was much loved for its stalwart ability to carry people and products over just about any terrain.